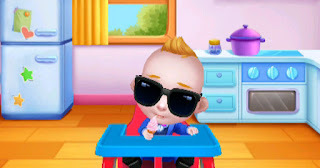 Boss Baby is a new care and dress up game developed by Tabtale for mobile devices. This game is targeted at young users i.e. toddlers. It's fun and colorful and it will no doubt give your kids only pure joy. In the game, the goal is to take care of the baby and keep him happy by pretty much doing anything he asks of you. Don't worry he'll never ask you to perform difficult tasks but only baby stuff such as preparing food, dressing him with cool outfits and assisting him in playing at the park, Occasionally, you will have to help him win a bike race with his fellow bossy babies. As per the graphics, this one is neat and colorful that children love. The gameplay is engaging although can be repetitive if you are an adult but hey, this app is for kids so I think by kids' standards this game is awesomely cool.